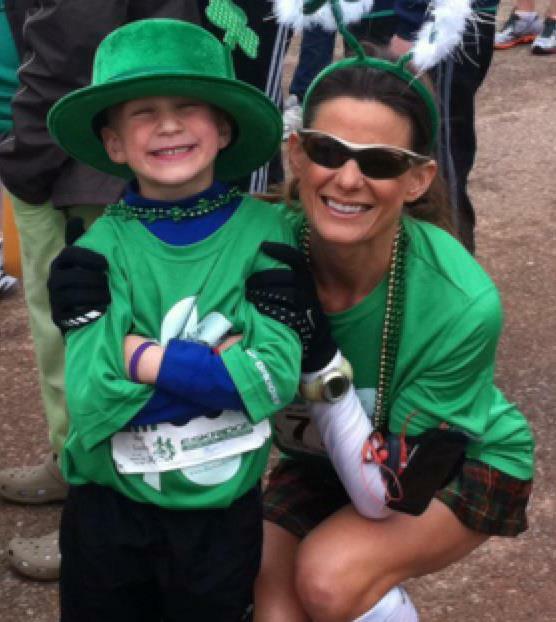 Last Sunday I took my family to the 2nd Annual RunLucky 5K and MissionMile, in OKC. My friends who work tirelessly for the Leukemia and Lymphoma Society have truly created an amazing platinum style event that already feels legendary! It was a great chance to dress up with the kids and husband and spend a Sunday afternoon with a few thousand fellow greenies:-) It is going to be a Young Family Irish tradition, and wearing the memory of Grandpa Mitch on our backs made it even more special. He LOVED St Patrick’s Day!!! 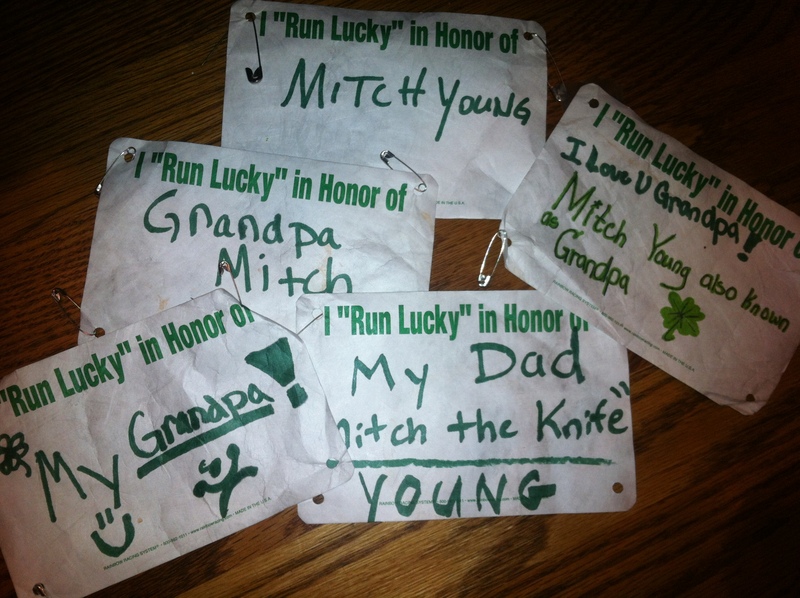 RunLucky for Grandpa Mitch- We miss you! Anyway, the girls ran their first Official timed 5K race, Madeleine won her age group 9-12, Izzy was second in hers 8 and under, and Sullivan posted a 10:30 mile in his mile (not official timed). Patrick PR’d since it was his first 5k ever lol, funny he did an Ironman before a 5K! He ran faster than he had ever gone, and it was seriously his 4th run since November lol. I had a goal to beat my time in this race from last year, and I did by 30 seconds! Ended up 2nd overall female and age group win, but I really was happy I got 20:40 on a sorta hilly course. NEXT year, 20min is going down!!! All in all a great day for the Young family, experience and results wise too! All day I was thinking about Lucky, luckiness, luck. to be lucky, to have luck, to not have luck. And I thought I am lucky to get to do this…. and I tell my friends I am lucky to “get” to train and exercise after the kids are in school, because I work from home on my own time. Everyday we are making choices that hopefully are in line with how we are changing and growing. I’m not waiting for luck to have it’s way with me. I will not credit luck anymore, because it sends the wrong message. I decided not to pursue vet school in 1996 because in my soul I knew I wanted to be a stay at home mom, not spend a hundred thousand dollars and feel guilty about that so keep working to justify the years and $$. I didn’t know that choice was going to create a future of freedom to train for endurance events, and have hours to spend on ideas, new businesses I am passionate about, grow an amazing family, and live the “lucky” life. The choice was in line with what I knew about myself in general, and subsequent choices and events started to line up and present themselves. I could only choose WRONG if it was against who I am and who God wants me to be, and even then, you can almost always course correct and get back on track! Thank goodness! I’m pretty much just rambling thoughts again. But want to encourage you to take responsibility for where you are, and give credit to the great choices you have made along the way to get you where you are now. I am constantly reading and writing and acknowledging and redefining where we want to be as a family, financially, individually. Some decisions just happen as inherent parts of that process, a natural gravity towards saying yes and no to things to stay on the path of your truest values. It’s not luck. So are you feeling Lucky?! I hope not! I hope you are feeling real tugs towards your greatness, and acting on them, one moment, one day, one month at a time- and please please have fun in the meantime! dress up, play, be a kid. Previous That is the Question…. Next The Triple T- aka Hardest Most Bestest Race weekend ever..
love it. way to put thoughts down and a great message. Happy St. Pattys to you and yours! We had our corned beef/cabbage dinner a day early with friends, green milk and all! So traditional Kristi I love it! 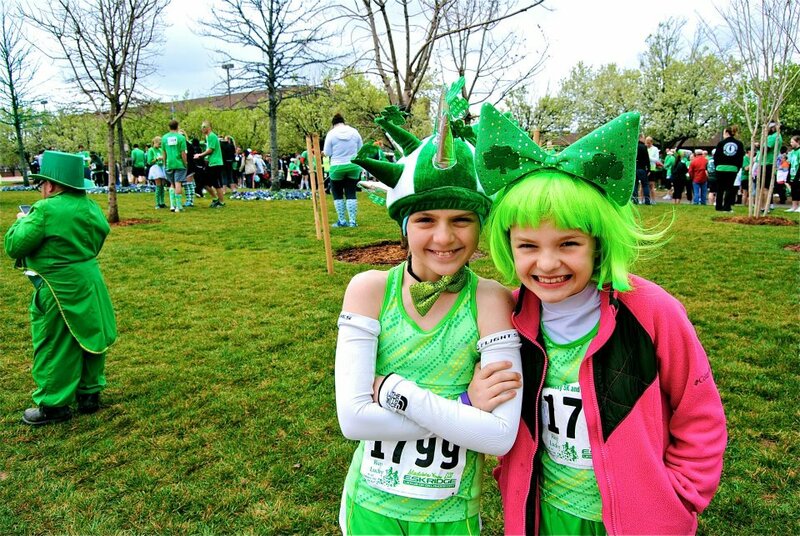 We were all day packing in our green clothes of course, playing with Floppy, and enjoying the first day of spring break- all of our green food was last weekend and yesterday at girl scout party:-) Hope you guys have a super weekend!